5 "fake boyfriend turned real" stars! This book had it all, great characters, action, lots of steamy scenes, good confrontations, and conflict. I really liked Quinn and Eli's Daddy/boy dynamic as it was very consensual and not over the top. Age play can be tricky and since Eli is 23, he's not too young but he is 10 years younger than Quinn. It was done well in my opinion and Eli was enjoying himself. Quinn's (deep in the closest) ex-boyfriend, Peter, is the man you love to hate! Eli with his opinionated mouth gives us perfect drama and gives Peter a verbal beat down when needed. I'm going back to read Kellen and Nate's story in the first of the series because I enjoyed these two even though they were not the main characters of the story. I didn't read the first book but I didn't feel like I was missing anything. Let me start off by saying that Peter is a total jerk-face a-hole!!! I loved Quinn instantly and I cried early on in the book. Did I say Peter was a jerk-face a-hole? When Peter does the unimaginable, Quinn needs a date. Eli is a breath of fresh air with a crappy past. Quinn and Eli have such hot chemistry I am shocked my Kindle didn't catch on fire. This was a good story with a little drama and angst. My only complaint is it ended abruptly. I thought a few more chapters or even an epilogue to explain what happened at Thanksgiving and what the aftermath was would have given the reader closure. 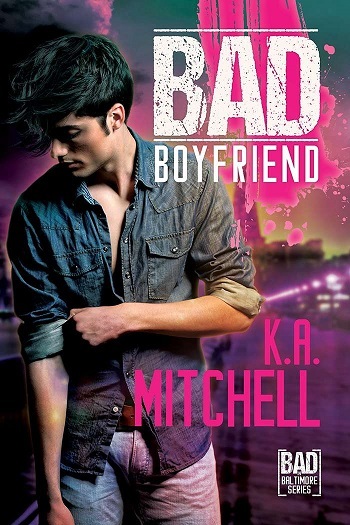 Reviewers on the Wicked Reads Review Team were provided a free copy of Bad Boyfriend (Bad in Baltimore #2) by K.A. Mitchell to read and review.